This project is a multiyear, multiphase project that is currently in the technical analysis phase. The project goal is to upgrade the Boundary Channel Drive/I-395 interchange to improve traffic operations and safety for all users. The existing interchange is inadequate for current demands and for future planned growth in Crystal City. 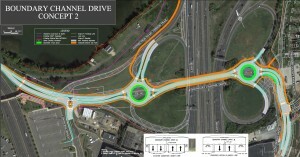 The interchange project also includes a connection to Long Bridge Park Drive and a bicycle connection from the Humpback Bridge to Long Bridge Park. Based on the feedback received at our June 2015 public meeting, and feedback received from VDOT and Pentagon staff, Arlington County leadership and FHWA staff selected the preferred concept to analyze in the Interchange Modification Report. 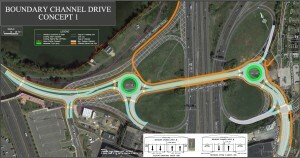 The preferred concept provided the best balance of traffic operations and safety for all modes, while minimizing impacts to the Pentagon and future improvements to Long Bridge Drive and the future expansion of Long Bridge Park. The preferred design concept includes converting the existing full cloverleaf interchange design to a partial cloverleaf configuration for the southbound I-395 ramps; the existing ramps in the southwest quadrant will be removed and all movements to / from southbound I-395 will be consolidated on the existing ramps in the northwest quadrant. In doing so, the two existing weaving segments along southbound I-395 in the vicinity of Boundary Channel Drive will be eliminated. Boundary Channel Drive will be reduced from four lanes to two lanes and all existing ramp terminals along Boundary Channel Drive will be converted to roundabouts. The eastern side of the interchange will be reconfigured to better separate various movements and provide an improved connection between Long Bridge Drive and I-395 northbound. 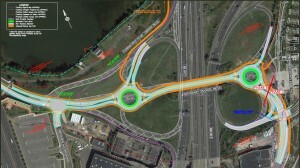 The proposed improvements also include enhanced pedestrian and bicycle connections from the Mount Vernon Trail on the west side of the interchange to Long Bridge Drive and Long Bridge Park on the east side of the interchange by providing shared use paths along both sides of Boundary Channel Drive through the interchange area. This is a regionally significant project that is being coordinated with our partners at FHWA, Department of Defense, National Park Service, VDOT and the District Department of Transportation. A public information meeting was held in June 2015. County staff and partnering agencies sought feedback on the elements that made up the original three design concepts to improve the interchange. The preferred concept is mostly a hybrid of Concepts 1 and 2. For both the eastern roundabout and the intersection of Long Bridge Drive, the I-395 NB on-ramp, and Long Bridge Park Aquatic Center, the preferred concept follows Concept 1. At the western roundabout, the preferred concept incorporates the design from Concept 2. Lastly, at the intersection of Boundary Channel Drive and the Pentagon Access Road, the preferred concept incorporates an unsignalized version of the intersection illustrated in Concept 3. Approximately $19 million of local bond and state funding.